If you'd rather donate through PayPal, visit my website and the button is at the bottom of the page. Here are the main points. 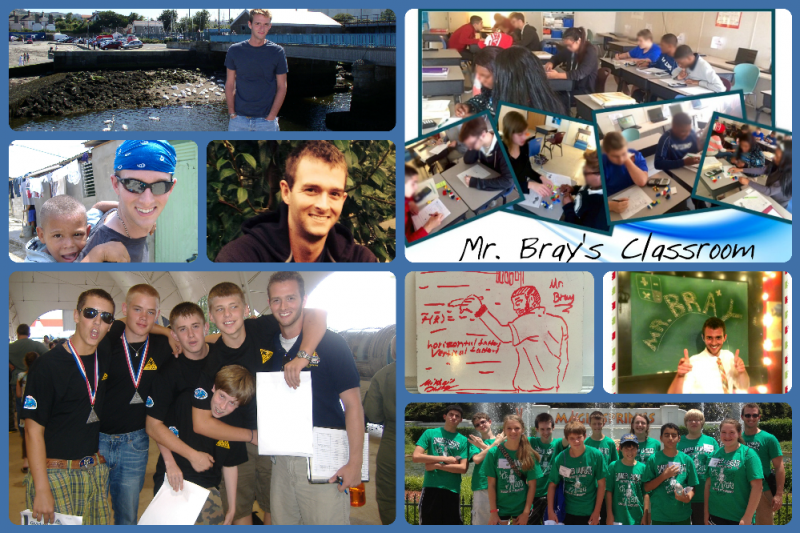 I was a good and dedicated teacher, who, as the result of a hate crime, lost my job and possibly ended my career. I need some extra finances in order to be able to continue with daily living expenses, rent, groceries, gas, utilities, and legal fees. @Sandy Albert - I'm not entirely sure. I had all pretty much all of my ambitions wrapped up in one endeavor, and now there are complications with that. I'm still working on stuff concerning social anxiety, and I'm at a point right now where I can really do some research into what I want to do next. So, to answer your question; I'm hoping for sooner rather than later, but that involves a lot of variables to complicate it for right now. A thank you song for my donors and supporters. Here's how I've been filling my time lately. Please comment below with any questions you might have for me that I missed with my video update. It was mostly off-the-cuff with some tangential rambling thrown in, so I likely missed a few key elements. Thank you all so much. with that 10,000 bucks you got. i suggest getting out of that horrible state. and move to a place where you have laws protecting you. 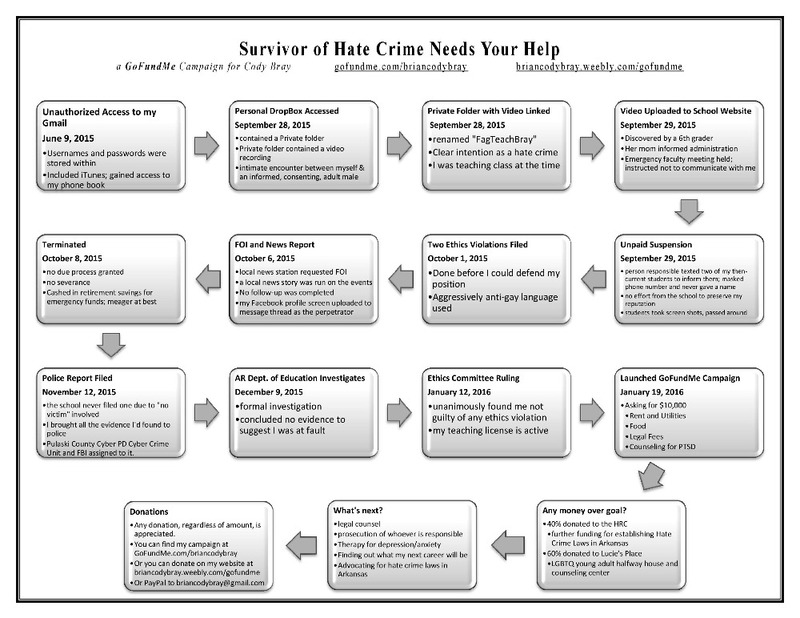 I see nothing misleading at all in the statement "Survivor of Hate Crime Needs Help." Hate crimes do not have to involve physical violence. Just as much harm can be done with not even a single drop of blood being lost. To suggest that Mr. Bray isn't a "real survivor" is nothing short of crass. Nathan Poe, you're right; this was not a violent crime. However, it has been emotionally and financially devastating. Luckily, Burke, the guy in the story from the link you posted, has been in contact with me personally and helping me out more than I ever could have imagined. So even though I wasn't sent to a hospital and don't have scar marks, this was still a crime committed out of hate; it's the motivation behind the action which determines its category, not its outcome. Do you expect to venture out into the working world sooner........or later? Preventing this man from making and distributing more of his deviant videos to kids is why authority spoke against his lifestyle choice. Brian, I'm so happy about the success you've had in getting your story out. Please know you have a deep responsibility to your LGBTQ brothers and sisters to use the gifts we've so generously given wisely. Sure, take yourself out for a nice dinner to celebrate, but don't waste this rare opportunity that you've been given. We're counting on you to succeed! (no pressure) ;) Have a great Valentine's Day weekend, hopefully with someone you love. I am so sorry! I came across your story through logo. I wish you all the best buddy. Stay strong. It's not easy to live openly in a conservative rural state. Don't lose faith in humanity because of a few bad people. It has been over 10 yrs (!) since we were co-counselors at CBS, but from that experience I know what a travesty this must have been- certainly for you, but also for the kids who won't have you as a positive influence. I'm sorry you've had to go through it. Whatever you decide to do in the future, I wish you best of luck, co-counselor. Ur a good man. Blossom where your planted. No matter where that may be.